James Baldwin, the eldest of nine children, was born in Harlem in New York City, on 2nd August, 1924. His father was a preacher, and as a teenager he was active in a small revivalist church. After graduating from high school he worked in a series of menial jobs. In 1948 Baldwin moved to Paris where he joined a group of black writers and artists that included Chester Himes, Richard Wright and Ollie Harrington. His first novel, Go Tell It on the Mountain (1953), concerned a young boy coming to terms with the religious beliefs of his father. His second novel, Giovanni's Room (1956) is an account of an American living in Paris. 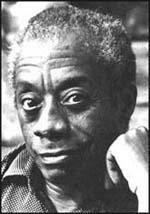 In 1957 Baldwin return to the United States where he became involved in the struggle for civil rights. His next three books concerned the issue of racism. A book of essays, Nobody Knows My Name (1961), a novel, Another Country (1962), A Talk to Teachers (1963), and a book on the Black Muslim separatist movement, The Fire Next Time (1963). He followed this was the play about racist oppression, Blues for Mister Charlie (1964). Other books by Baldwin include Going to Meet the Man (1965), Tell Me How Long the Train's Been Gone (1968), No Name in the Street (1972), If Beadle Street Could Talk (1974), The Devil Finds Work (1976), Just Above My Head (1979), Jimmy's Blues (1983), The Evidence of Things Not Seen (1985). A collection of autobiographical writings, The Price of the Ticket, was published in 1985. James Baldwin died in Saint-Paul, France on 1st December, 1987.